On a night when most of their contemporaries and colleagues were 1000 miles away in Austin Texas, Oneida returned to their roots and played a show the likes of which their fans have never seen. It was 13 years ago when Oneida played its earliest gigs at the Knitting Factory’s prior location on Leonard Street. While the personnel has shifted, Oneida has always been capable of literally stretching the boundaries of their indescribable music to unimagined lengths. 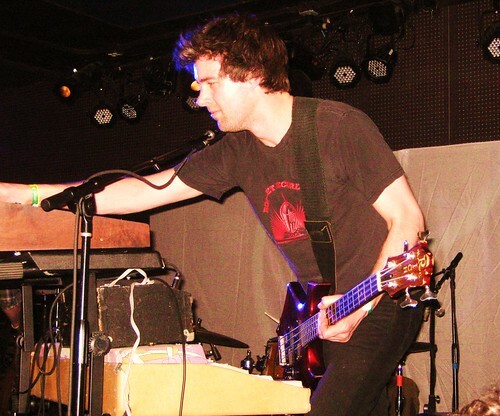 On Friday night at Knitting Factory’s new Metropolitan Avenue location, there were two distinct portions of this show where Oneida fans were shaking their heads with knowing grins — the powerful opening “Ghost in the Room” (sans vocals) flowed into a freeform jam in the key of B that last for twenty-nine minutes, but never lost its intensity. While the improvisation contained quiet moments, melodic sections and times of sheer fury, the band’s commitment never wavered. Its that unparalleled musical stamina that was again on display during the set’s closer. “Sheets of Easter” has had longer versions, but at over eight minutes, the machine-like repetition of the “light” riff was nevertheless as dizzying and mystifying as ever. We recorded this set with the four microphone rig set up on the right corner of the soundboard booth. The microphone configuration was arranged to maximize the sound reception in this rectangular room and I am quite pleased with the excellent results. Enjoy! If you email nyctaper for access to this recording, we expect that you will PLEASE SUPPORT Oneida, visit their website, visit their MySpace page, visit their page at Jagjaguwar Records, and purchase the latest CD Rated O at the Jagjaguwar site [HERE] and their earlier releases [HERE]. Can’t wait to listen to this–Thanks! Awesome thank you very much for this great live set. Haven’t seen the O in a while now. This should tide me over nicely… Thanks for sharing the love!